Wow, I’m lagging behind on my timeline something fierce….. it’s mid-February and I’m just now announcing our Rescue of the Month! But I think it’s (hopefully) worth the wait. This month we’re featuring Underdog Rescue, a foster-based nonprofit that’s been around for over a decade. At that time, rescues weren’t allowed to take in “pit bull” breeds from Minneapolis Animal Control. Underdog founder, Shannon McKenzie, worked with an attorney to get the pit bull policy changed, and started this rescue to be an advocate for the “underdog.” They’ve since placed over 2,150 dogs and cats! Fun fact about their logo….. it was developed by dog-friendly Thorn Creative, the same company who’s currently working with our friends at Sidewalk Dog on their new branding! Shannon brought a couple of puppy mill rescues to the studio this week to get some photos. 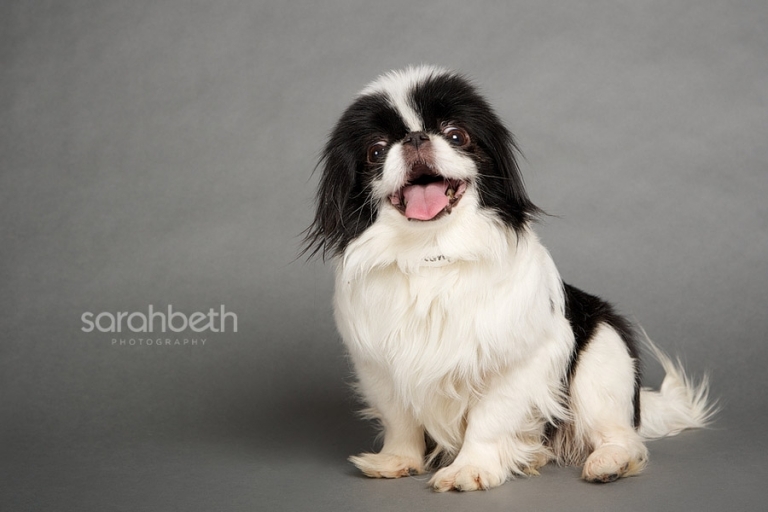 First up is Dumpling, a teeny tiny Japanese Chin. She’s about 6 years old, is deaf, has bad knees and a Grade 5 heart murmur. This little peanut needs all the help she can get! Puff is a 3-4 month old mix, also rescued from a puppy mill. (Shih Tzu / Maltese?) She also has a congenital heart defect with a murmur. She’s a sweet girl that needs lots of love to bring her out of her shell. So if you have a heart to help these underdogs’ hearts, you can make a donation by clicking here. They are so cute! I hope they find loving homes that will treat them like gems! Dumpling is darling. Japanese Chins need extensive exposure to people and to unusual sights and sounds so that their natural caution doesn’t become suspiciousness or shyness, which can be difficult to live with. It has taken a year of much love and determination for our Chin to become attached. They do tend to gravitate to one person, so life in a big family with lots of noise and changes may not be for a Chin, but they are excellent for a single or couple who want a quiet, devoted lap-sized companion. I see Japanese Chin in little Puff for SURE! Looks just like my girl Martha. These beautiful pictures will find them homes in a minute I’m sure! « feelin’ the love :: a minneapolis pet photography giveaway!